Everything was perfect, Cesar is our absolute favourite! Great personality and super service! Cesar was fantastic. He was well-prepared and came up with a superb menu that catered for a strict vegetarian guest as well as five carnivours. He was personable, organised, punctual and communicative. Beyond that, every dish was delicious, and he even stored leftovers for me (I had a rather indulgent lunch the next day). Not only that, he left my kitchen cleaner than when he'd started, so all I had to do was add the wine glasses to the dishwasher and turn it on. The experience with Chef Cesar was a real success. 6 months after our dinner, we are still talking about his "New season asparagus, 63 degree egg, hazelnuts and prosciutto". One of my guests has already tried to cook some 63-degree eggs 3 times without succeeding... That was a unique experience we should taste again! The seabass was beautifully prepared as well. We all loved it. Many thanks! Very good quality food and Cesar was a pleasant person to have in your home. Cesar prepared a very tasty, varied selection of canapes for a Champagne Reception for a charity event in Mayfair attended by numerous celebrities. Cesar was extremely helpful and personable and managed to create his delicious canapes in the a very tiny, basic kitchen. He is a very talented and professional chef and I will defintely call upon his culinary skills again for future events/dinner parties. What a brilliant chef! as a Mustard Sommelier I absolutely ecstatic with how well he played on the requested mustard flavoured dishes. I would strongly recommend Caesar for any event! He can really compliment your dinner party. This is the second time I have used Cesar for a canape reception at my office. He is really organised and clean and tidy and easy to work with, particularly when I am running around trying to do other things! The canapes were delicious and everyone commented on how enjoyable they were and there weren't any left at the end. I would happily use him again. Nous avons beaucoup apprécié le menu du chef César Fernandez avec des ingrédients simples mais cuits à chaque fois soit de manière originale soit avec quelque chose d'original et un mélange de styles qui marchent très bien ensemble. Une excellente soirée! Friendly, personable and delicious... Cesar delighted us with some rich flavours and textures, without any superfluous distractions. It is tasteful, in all sense of the term. Lovely chef, delicious and so nice-looking dressing, perfect cooking, seasoning and quantity. Chef César, Thank you ! César is a great chef and we had a perfect evening with stunning food. He kindly switch the starter to accommodate us: the flaked confit of rabbit was amazing. Guinea fowl as main was delicious too. Great experience as always! We had a lovely evening with food that striked the right note: simple, tasty, and well-presented. I still have very fond memories of the chocolate tart. It was simply amazing! We had a fantastic evening with Cesar, he is very nice and friendly and also very professional and organised. We have a small kitchen but he managed to serve a tasteful 3 course dinner for 8 people, all on time and beautifully presented. My kids loved to see him prepare a whole octopus, and he left all left-overs nicely wrapped in the fridge, so we even had a nice meal the next day. Highly recommended! Well balanced dishes and flavours. I particularly loved the dessert which was exceptional! Excellent !!! Lovely dinner , special food and very kind chef . I ll suggest him to other friends . It was excellent. The service, and the cleaning as well. Everything was perfect. We enjoyed a lot the dinner! And we will definitively use your services again. Cesar is a very talented chef. His food hit all the right notes. His cuisine is both refined and generous with the right touch of extravagance. His octopus was perfectly cooked and I really enjoyed the main dish. The desert was out of this world! He is very friendly and organised. I really enjoyed being around him. Thank you Cesar for a delicious dinner! Enjoyed the three courses, including the octopus starter which was very tatsy and especially the dessert! The lemon cake dessert was simply perfect, and I am a big fan of the white chocolate crumbs! As a host, I have to say that César was super friendly. Sharing his experience while doing his magic in my own kitchen! Cooking being one of my favourite hobbies I appreciated all the wonderful tips César gave me. The menu was delicious, and he definitely impressed us all with the dessert! César is a very skilled an personable chef. 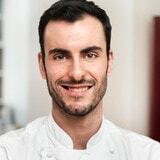 His cooking knowledge spans from the Spanish most delicious specialties to more international dishes, always with an original touch and attention to the details. Thumbs up ! Fresh, diverse and full of flavour. I was trained classically a but I love to explore different cusisines and ingredients . Lemon, because you can add it to almost every single dish and it will elevate the flavor to another level. If you believe this content violates or infringes your rights, César Fernandez may not know. You could solve this problem by contacting him.